I am going to try and make a long story short, but I am sure it will still be long. 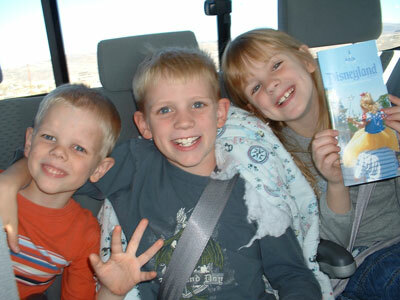 About six months ago, we planned to go to Park City with our whole family for harvest break. 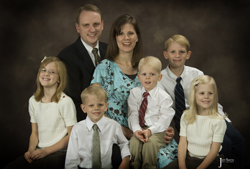 We had originally planned to go with Brian and Natalie Ashton and their kids, but they decided to move to Wyoming which made it impossible for them to come. So, Russ and Amanda Brighton, our last renters, decided to share the condo with us. They were the ones who made it possible for us to get a great deal, and they are good friends. They brought their son, Jayden who is a little younger than James. However, a couple weeks before we planned to leave, Lisa, one of the teachers at our store, asked Richard if we could go to San Bernardino to pick up a camper shell for her new Toyota Tundra. 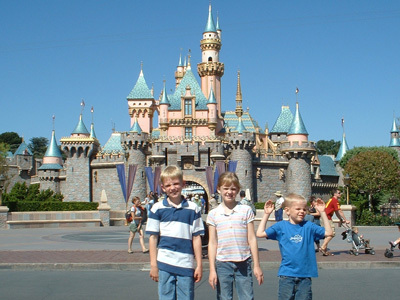 He said, �Sure, if we can take our kids to Legoland!� He didn�t think she was serious, but it turned out that it was worth it for her, so she paid for our gas and admission into Disneyland (Legoland was closed that day). We left Park City on Tuesday morning, drove to Anaheim, went to Disneyland on Wednesday, picked up the camper shell Thursday, and drove back to Park City. 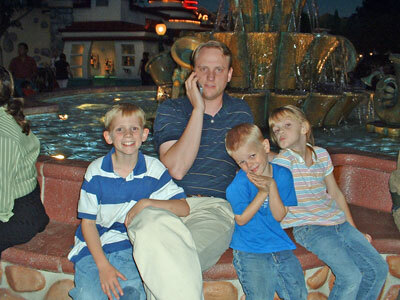 Russ and Amanda watched James and Sarah in Park City since they wouldn�t fit in the pick up. It ended up taking a lot longer than we thought to get the camper shell installed. We didn�t end up leaving San Bernardino until about 4:30 Thursday afternoon! We made it to Park City at about 5:00 the next morning. I am actually quite surprised we didn�t hit a deer. We saw about eight of them in the road while driving through Provo Canyon, and a couple more as we got closer to Park City. We had to drive slowly, but luckily, we made it without killing any deer. The condo was very nice. There was a big indoor/outdoor pool, so we did lots of swimming! And, that weekend happened to be conference weekend so we were able to relax and watch conference in the condo. It turned out to be a very fun and much needed get-away for our family. 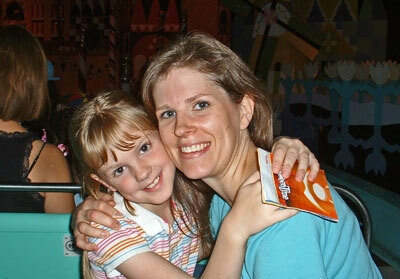 This first picture was taken right after we told the kids we were going to Disneyland. We kept it a secret until we were actually on the road to Anaheim. They were very surprised! I was hoping to get a picture of Nicholas Cage, since he was standing really close to us for quite a while, but Richard wouldn�t let me. (He didn�t want me embarrassing him�:) Here is Richard trying to do a little business between rides. 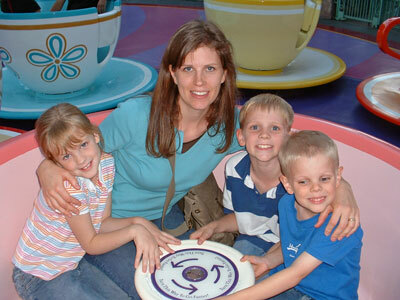 Richard had a lot of fun with the tea cups. 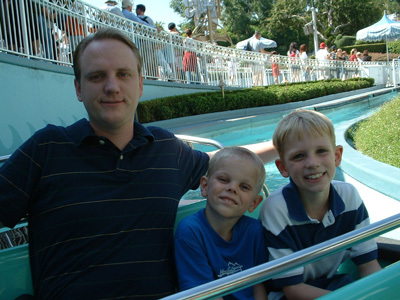 He had it spinning by far faster than anyone in the history of Disneyland has, and there were five of us in one! As we were all trying to keep from vommiting I can recall him saying (grunting and with a red face), "I am going to get my money's worth out of these teacups!!!" 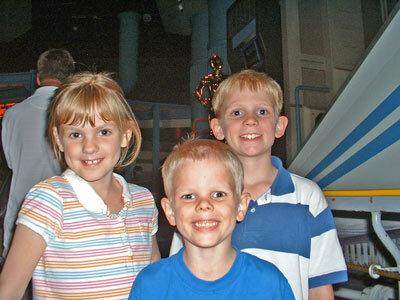 Star Tours was definitely a favorite, especially since we had them watching the Star Wars movies on the long drive there. However, after the ride William kept trying to convince us that the name was wrong, "That wasn't Star Tours, that was Star Wars!" Can you guess what they want to be for Halloween? 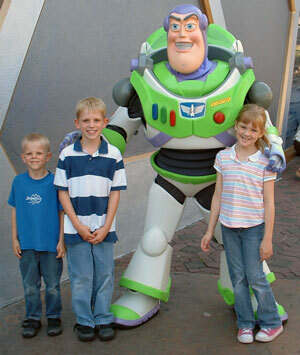 Thomas and William especially loved the �Buzz Lightyear Astro-Blasters� ride. Here are some pictures of that particular ride. 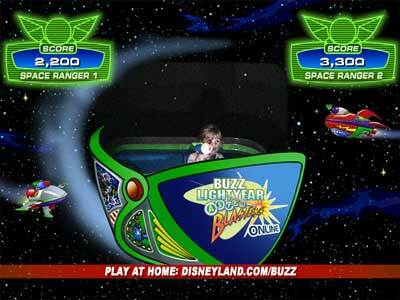 For those who don�t know, you get a laser gun and shoot at targets all through the ride and it keeps score for you. (No wonder they liked it � it�s like being in a computer game!!!) Our scores are on the pictures. I would like to say I got the highest, but Richard (who we didn�t get a picture of) ended up with a score over 100,000.